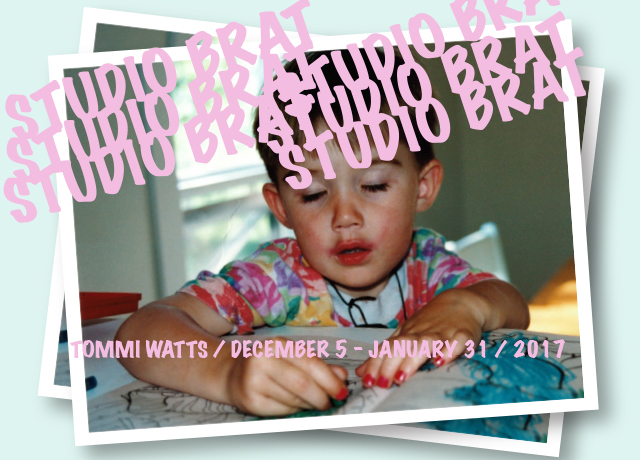 Studio Brat is a durational installation series by Calgary-based artist Tommi Watts. Leveraging the TRUCK Contemporary Art +15 Window as a temporary studio space, the installation projects a constant state of flux and literal fervor. A confrontation to the voyeuristic and very public nature of the +15 window galleries, Studio Brat creates a mise-èn-scene of the invisible labour and various artistic modes of production an artist undertakes in order to create new work. Part aphoristic recording and part assemblage, Studio Brat exhibits and ultimately critiques the subjective conceptions and vulnerabilities of a bratty, white, female. Tommi Watts combines elements of performance, drawing and installation to inform a social / economic commentary, self-reflexive of a ‘Studio Brat’. A recent Bachelor of Fine Art graduate from the Alberta College of Art + Design, Tommi has maintained a studio practice, and is currently the 2016 Calgary Board of Education K-5, artist in residence. Tommi is also super pumped about scoring a FREE STUDIO space in the TRUCK +15 window! !